In my last post I did some further pre-checks to identify the main reason for the update failure. I found out that the build version of GFI MailEssentials is up-to-date, my license key is entitled to download update files for SpamRazer and both update procedures (auto and manual update) fails. At this stage I can only say that the SpamRazer module fails permanently to download the updates files. Now I need to verify whether the update failure also affects the Anti-Phishing and the Bayesian filter module of GFI MailEssentials. a) Is the Phishing module “enabled”? b) Is the licensing status of the Phishing module “licensed”? In the next step go to the tab “Updates”. (4) Click on “Download updates now…” and after five minutes check whether the download process still fails. GFI MailEssentials will confirm that the download process has started successfully. The result of the last download attempt will be shown in form of a message box. The message box confirms that the download of the update files for Anti-Phishing has been successful. The SpamRazer update fails permanently; however the Phishing updates seem to be working fine. This is quite interesting! Now, do the same procedure for the Bayesian filter. The required steps are similar. As you can see from the next screenshot the Bayesian filter is also able to check for the latest update files. 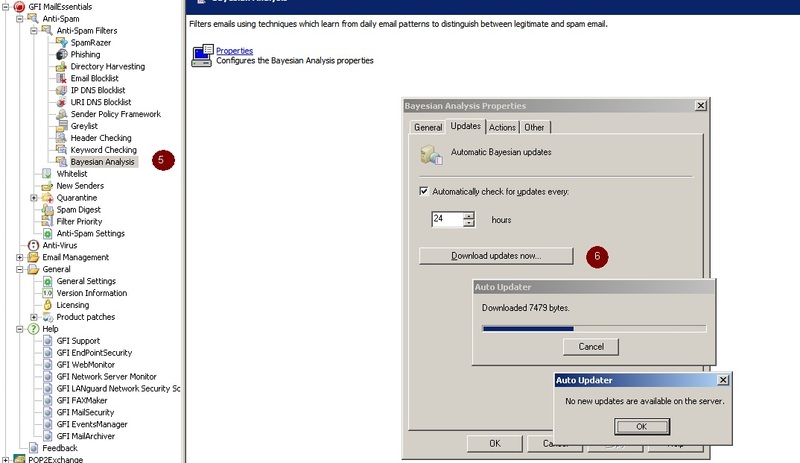 The SpamRazer update fails permanently; however the Phishing and the Bayesian filter updates seem to be working fine. This means that only one anti-spam module is failing to download the updates. 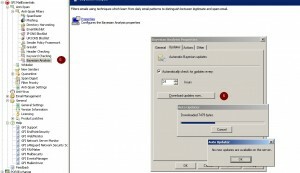 SpamRazer downloads the update files from a different update server. Therefore, I need to check if my Proxy Server or Firewall may have blocked the outbound HTTP connection to the SpamRazer update server. The URL of the SpamRazer update server is: sn92.mailshell.net and not “update.gfi.com”. 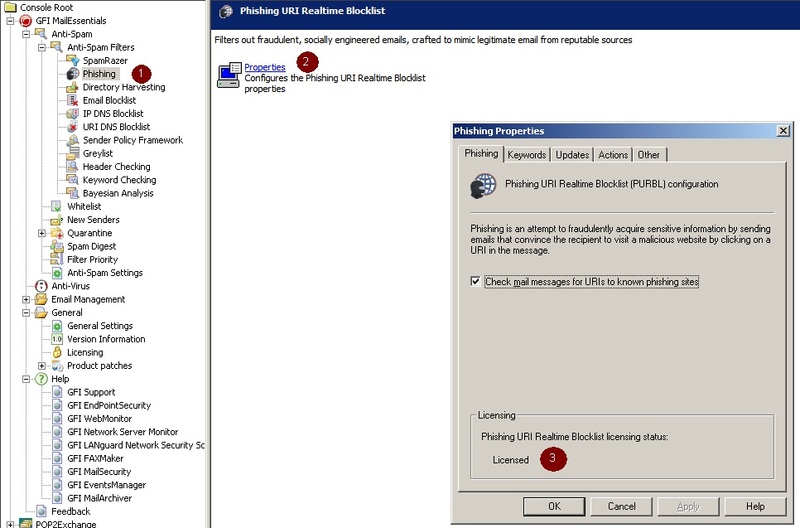 I checked the settings in my Microsoft ISA Server and I found out that it was blocking the outbound HTTP connection to sn92.mailshell.net. This was the main reason for the update failure issue for the SpamRazer anti-spam module. Furthermore, I could see that the update requests by the Bayesian Filter and Anti-Phishing module to “update.gfi.com” are not blocked by my ISA Server. This would explain why both anti-spam modules succeeded to download the update files. After granting access to the URL “sn92.mailshell.net” from the GFI MailEssentials machine the update failure issue was fixed. Subject: Failed to check for SpamRazer updates. There was a failure when checking for SpamRazer updates.